People and their activities cause more than 90 percent of all wildfires in Texas. The largest number of human-caused wildfires is a result of careless debris burning. Other causes of wildfires include sparks from welding and grinding equipment, carelessly discarded smoking materials, vehicles’ exhaust systems and arson. 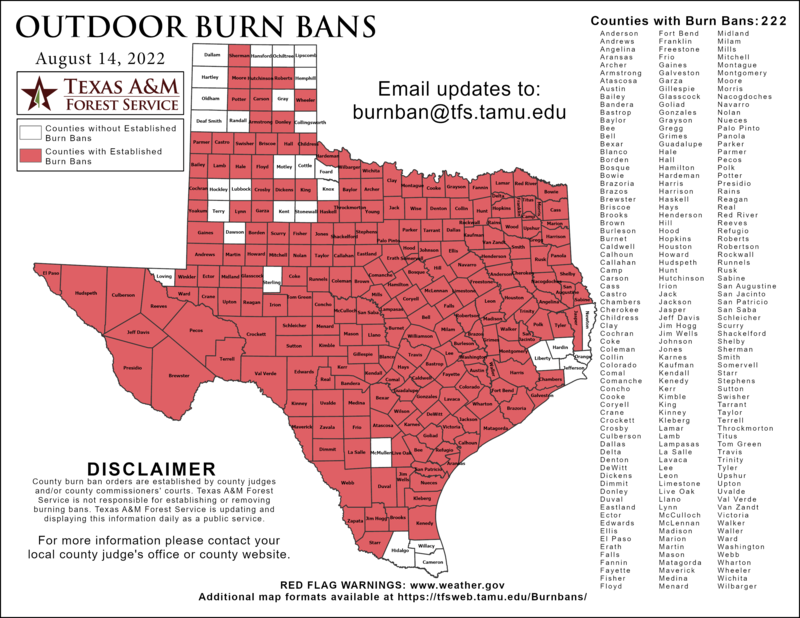 Compliance with burn bans reduces unsafe debris burning; but a burn ban does not have to be in effect for outdoor burning to be illegal. Negligently allowing your fire to escape onto someone else’s property is a Class C misdemeanor, punishable by a fine up to $500. Check for local bans on outdoor burning. Keep informed of wildfire danger levels. Avoid burning trash, leaves and brush on dry, windy days. Check to see if weather changes are expected. Postpone outdoor burning if shifts in wind direction, high winds or wind gusts are in the forecast. Before doing any burning, establish wide control lines down to bare mineral soil at least five feet wide around any burn barrels and even wider around brush piles and other piled debris to be burned. The larger the debris pile, the wider the control line needed to ensure burning materials won’t be blown or roll off the pile into vegetation outside the line. Burn household trash only in a burn barrel or other trash container equipped with a screen or metal grid to keep burning material contained. Never attempt to burn aerosol cans; heated cans will explode. Flying material may cause injuries and the explosion may scatter burning material into nearby vegetation and cause a wildfire. Stay with outdoor fires until they are completely out. Keep water and hand tools ready in case your fire should attempt to spread. Campfires can be a comfortable and relaxing place to spend time with friends or family. Follow these tips when burning a campfire. Make sure campfires are allowed on the property. Check for designated areas such as a fire ring or a fire pit. Look for a site that is at least fifteen feet away from tent walls, shrubs, trees or other flammable objects. Avoid areas with low hanging branches. Prepare a spot so that you are able to stay with it while it is burning and make sure it does not escape. Clear a 10-foot diameter around the site. Dig a pit in the dirt approximately 1 foot deep. Arrange rocks in a circle around the pit. Fill the fire pit with small pieces of dry wood. Place unused firewood upwind and away from the fire. Keep the fire at a manageable size. Never leave a campfire unattended, if possible allow the wood to burn completely to ash. Pour water on all embers until hissing sounds stop. Stir the campfire ashes and water with a shovel. Scrape logs to remove embers. Stir and make sure everything is wet and cold to the touch. What if I do not have access to water? If you do not have access to water, mix dirt and sand with embers. Continue adding dirt and stirring the embers until everything is cool to the touch. Do not bury the fire because it will continue to smolder and can catch roots on fire. Wildfires can wreak havoc on an agricultural community. Whether the fire burns up thousands of acres of pasture or entire crop fields, the economic loss to the farmer or rancher can be devastating. Taking the time to maintain equipment and prepare work areas can mitigate the threat of a fire starting on your farm or ranch. Keep mufflers and spark arresters on agricultural equipment in proper working order. Watch for rocks and metal when bush hogging or mowing. Monitor hay baling operations closely, dry hay can ignite within the baler. Remove vegetation from the work area. Use a sprayer to wet down the work area prior to starting welding operations. Have someone with you to spot any fires that sparks ignite. Avoid parking vehicles in dry grass tall enough to touch the catalytic converter on the underside of your vehicle. Smokey Bear has been the face of wildfire prevention for 70 years. The Smokey Bear campaign is the longest running public service advertising campaign in United States history. Wildfire prevention remains one of the most critical issues affecting our country, and Smokey’s message, “Only You Can Prevent Wildfires” is as relevant today as it was in 1944. Teachers and fire departments can obtain Smokey Bear fire prevention materials through http://www.symbols.gov/.